Well, that was quite a show at Louis Vuitton this morning. 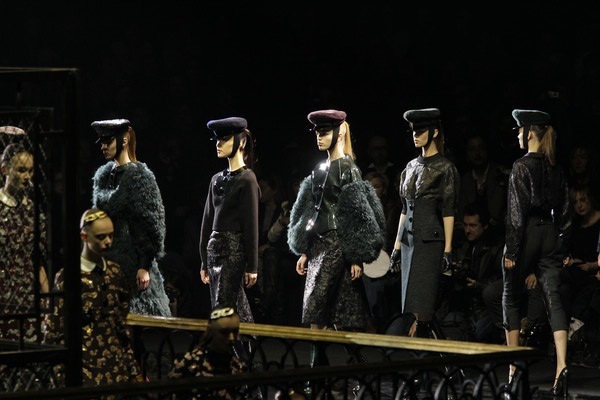 Marc Jacobs was in the mood for some strong mistresses. 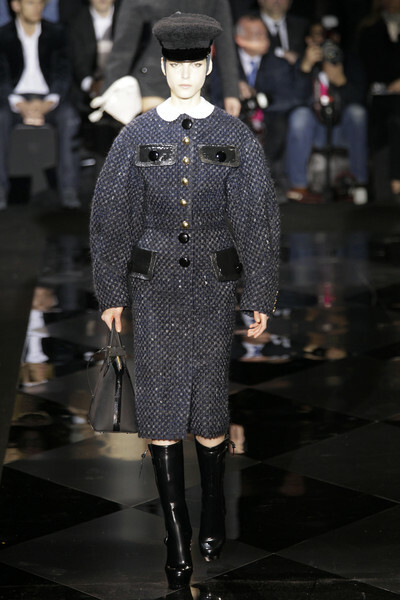 The inspiration seem to come from the movie Night Porter. 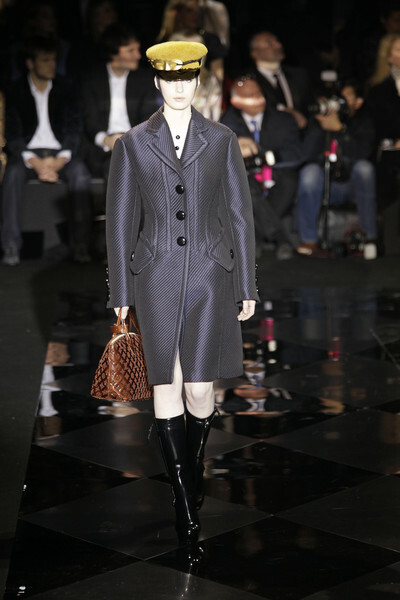 But according to Marc Jacobs explanation the inspiration came form the obsession people have for Loui Vuitton-bags etc. “The definition is an unreasonable obsession with objects or things. 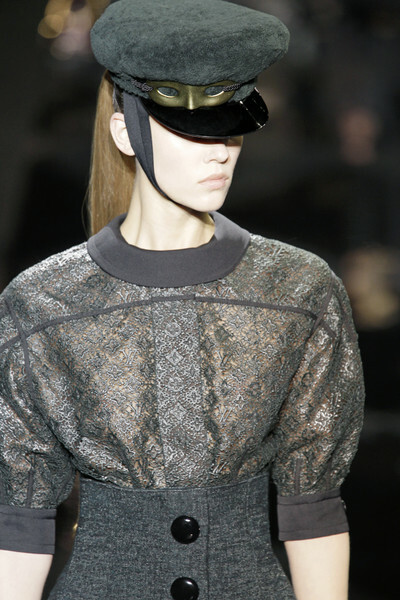 Which is sometimes Vuitton bags” he told WWD. So it was extravagance to the max, with an 18-karat gold handbag cuffed to a girl’s wrist. There was a retro, hotel-inspired elevator bank that rose from the floor below and were the models started out. Almost everyone carried bags, not all in gold, but in python, harlequin-cut shearling, embroidered monogram rubber. Python came lacquered; fake fur, waxed; guipure lace, made to look like plastic. There was lots of see through, and also rubberized, plasticized and waxed fabrics with police-hats, silk-stockings, jodhpurs. 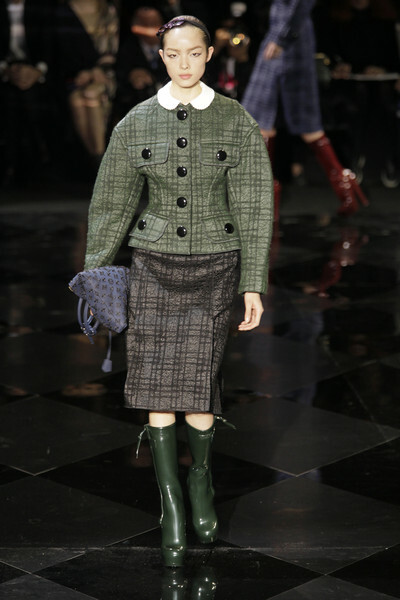 But also more wearable clothes like tweed coats and jackets taken from men’s classics which were reshaped into hourglasses and sleek sweaters. Highly energetic post, I enjoyed that bit. Will there be a pat 2?